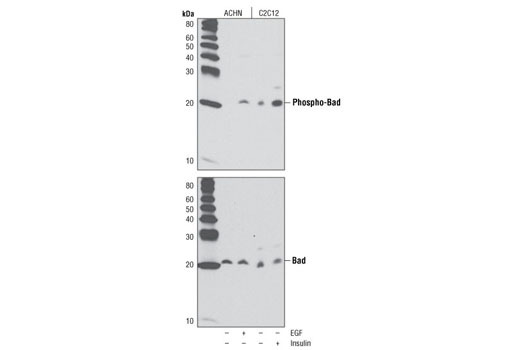 Western blot analysis of extracts from ACHN cells, untreated or treated with Human Epidermal Growth Factor #8916 (100 ng/ml, 30 min), and C2C12 cells, untreated or insulin-treated (100 nM, 30 min), using Phospho-Bad (Ser136) (D25H8) Rabbit mAb (upper) or Bad (D24A9) Rabbit mAb #9239 (lower). Western blot analysis of extracts from COS-7 cells, treated with Human Epidermal Growth Factor #8916 (100 ng/ml, 30 min) in the presence or absence of calf intestinal phosphatase (CIP) plus lambda-phosphatase, using Phospho-Bad (Ser136) (D25H8) Rabbit mAb (upper) or Bad (D24A9) Rabbit mAb #9239 (lower). Western blot analysis of lysates containing Bad Control Proteins #9293, comprised of nonphosphorylated and phosphorylated Bad peptides, using Phospho-Bad (Ser136) (D25H8) Rabbit mAb. 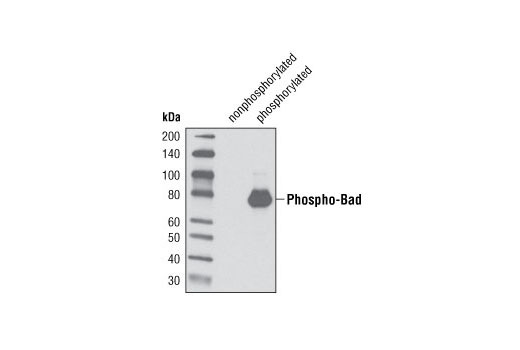 Phospho-Bad (Ser136) (D25H8) Rabbit mAb detects endogenous levels of Bad only when phosphorylated at Ser136 (equivalent to Ser99 in human and Ser137 in rat). Monoclonal antibody is produced by immunizing animals with a synthetic phosphopeptide corresponding to residues surrounding Ser136 of mouse Bad protein. Yang, E. et al. (1995) Cell 80, 285-91. Datta, S.R. et al. (1997) Cell 91, 231-41.
del Peso, L. et al. (1997) Science 278, 687-9. Bonni, A. et al. (1999) Science 286, 1358-62. Tan, Y. et al. (1999) J Biol Chem 274, 34859-67. Harada, H. et al. (1999) Mol Cell 3, 413-22.